Like many men of a certain age, I have forgotten most of my memories. I can hardly remember what I did last week or last year or who starred in which movie I can barely remember watching. As I reach my mid-50s, I connect even more to my father, who is having a harder time remembering names and moments as he gets close to the age of 80 on August 14th. When I asked my father what he was doing when Hank Greenberg came home from the war and joined the 1945 Detroit Tigers, he remembered precisely. It was July 1, 1945 at Briggs Stadium (which later became Tiger Stadium) with 47,000 other war-weary baseball fans, the first game back since Greenberg joined the army on May 7, 1941. It was the top of the 8th inning when my father decided he couldn’t wait till the end of the game and went to the Briggs bathroom. And it was there that the thunderous applause made him realize he had missed the memorable moment when his hero, “Hammerin’ Hank Greenberg”, hit his first home run in 4 years. In the last game of the season on September 30, 1945 Greenberg hit a grand slam to give the Tigers a 6-3 win over the St. Louis Browns and the American League pennant and then led his team to a 4-3 series win over the Chicago Cubs to win the World Series. A 14-year-old boy joyfully celebrated with an entire city the end of a World War and a hard-fought victory for his beloved Hank Greenberg and the Detroit Tigers. There are certain moments in life you can never forget. One of these moments for me was Sunday, June 12, 2011, an afternoon spent in Detroit with my dad after my wife, Judy, bought and gave us two tickets to the play, Ernie by Mitch Albom, at the City Theatre, a week before Father’s Day. It was almost 66 years after the Greenberg return game in Detroit. My father was home alone after my mother left to visit my sister, brother-in-law, and niece in Columbus over the weekend. We left at 3pm to park at the Fox Theatre parking lot before the Tigers game across the street at Comerica Park ended. We went to the Hockeytown Café across from Comerica Park, the same building as the City Theatre play, sat and ate and watched the 9th inning. The Tigers lost the game, 7-3, but we didn’t care much. We reminisced about the city in its heyday. We talked about the stores nearby such as the Hughes and Hatcher on Woodward and the theatre district down the street from the Fox Theatre. We talked about where he lived and I learned for the first time that my dad and his sister, my Aunt Selma, lived together in his teens, away from their father while their mother was in Eloise, the psychiatric facility (sometimes called an “insane asylum,”) on Michigan and Merriman. He pointed south, showing me where he and his sister lived, off Woodward Avenue. They rented a room next to a “cathouse,” something I had never known. We reminisced about my Aunt Sylvia’s husband, Orville, and wondered when he died. My dad called his oldest sister, Helen, who still seems to remember everything and said that Orville died in 1981, three years after my dad’s youngest sister committed suicide. My dad said it was astounding that he died 20 years ago and I pointed out what was more amazing was that his death was actually 30 years ago. 30 years ago, my brother, Kenny was only 12 and played in Little League baseball. My parents drove him to his games and also took him to his bowling league. Sometimes, my father took Kenny to see the Detroit Pistons and Tigers. Kenny was a huge sports fan and loved Michigan’s college teams and Detroit’s pro teams but didn’t get to see a World Series championship because he was born a few months after Detroit won the 1968 World Series. One of the reasons my dad and I had not gone to many Tigers games over the last 30 years is that baseball memories can be painful. It was on the night of July 20, 1982, that my dad took my brother, Kenny, to a Detroit Tigers baseball game and it was on that night, less than a mile from home, that a car crashed into the passenger door of my father’s car. And it was on that night, a few hours later, when my dad’s youngest child, his 13-year-old son, my little brother, had his last breath on this earth. My dad and I didn’t talk about Kenny or the 1982 Tigers, two years before their next World Series championship, on this Sunday before Father’s Day. We focused on other things, although I know my dad can’t think much about the Detroit Tigers without remembering his youngest boy. My wife, Judy, and I saw Woody Allen’s movie, Midnight in Paris, the night before the play. The movie is about longing for the past, nostalgia, and choosing to live in the joy of another era. At the Hockeytown Cafe, before the play, my father and I walked around the restaurant and stared at the heroes of decades past. In this sports museum of memories, we viewed the framed and signed photos of great hockey players like Howe, Yzerman, Lindsay, and Lidstrom. We spent time staring at each Tiger legend, Greenberg, Kaline, Trammell, Cobb, and reminiscing about some of the moments we remembered, those we cannot forget. The play, Ernie, is stuffed with memories and nostalgia for a simpler time before the Internet, before smartphones, Twitter, Facebook, and the incessant noise from 24-hour cable news stations. When we think of Ernie Harwell, we can hear his Georgian twang, that voice that we knew more than just about any of our friends. He was like the friendly, helpful neighbor who never moved away. We listened casually or intently, savoring the slow, steady pace of baseball. I remember listening on my friend’s lawn across the street when Ernie announced two grand slams in one game from Tiger Jim Northrup (who recently died at age 71). Most Detroiters of my age can also remember Northrup’s triple against Bob Gibson in the seventh game of the 1968 World Series to clinch the World Series. 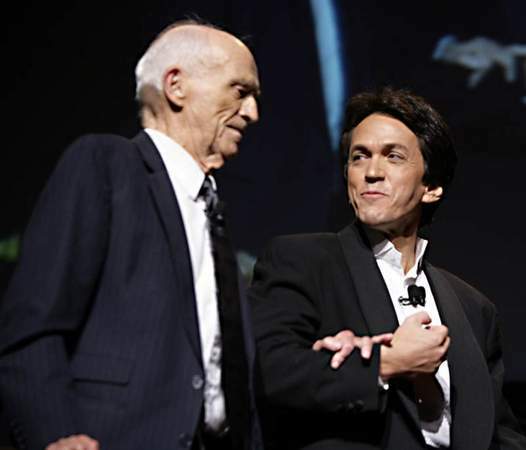 Most Detroiters didn’t get to attend the night of the fundraiser for Mitch Albom’s book, Have a Little Faith, a few weeks after Ernie’s final speech at Comerica Park. Judy and I were fortunate to be in the audience and listen when Ernie Harwell spoke to Mitch about faith and serving God and baseball and looking forward to heaven and people reaching out like roots of a tree to connect with others. I don’t think anyone there will forget that night. Mitch Albom’s play, Ernie, takes place in the tunnel where the players take the field on the night the then-91-year-old Harwell gave his farewell speech at Comerica Park. 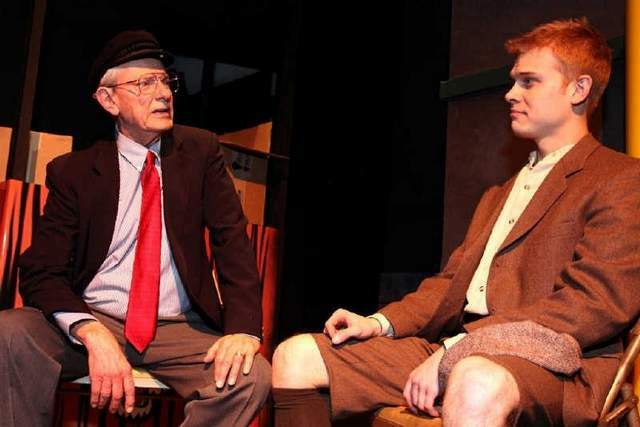 It stars veteran Detroit stage actor Will David Young as Harwell and newcomer T.J. Corbett as “the boy,” a mysterious figure dressed in brown knickers, talking about Harwell’s memories. The play evolves in the nine innings of Harwell’s life, and features two video screens with real Ernie Harwell calls and Major League Baseball highlights to complement the on-stage dialogue. We heard Ernie’s real stories about his early days when he was a paperboy and had a speech impediment, when he was trained to be an announcer for the Atlanta Crackers. We heard about Babe Ruth signing his shoe, Jackie Robinson being threatened by the KKK, Ernie being traded for a player (the only trade ever of a player/announcer.) We heard and saw footage of Willie Mays, learned how George Kell helped bring Harwell to the Tigers. We lived through the tumultuous 1968 season that helped soothe the smoldering tension from the ’67 riots and saw Mark Fidrych (the Bird), who swept us all away with his enthusiasm and joy and great pitching, even if it was only for one glorious summer. We lived again through the 1984 season that ended in a world championship. We saw Kirk Gibson hit his World Series home run and listened to funny stories about Sparky Anderson. We felt Ernie’s love for his wife of 68 years, Lulu, his family, and the devotion to his religious faith. We got to hear about his firing and rehiring as well as the last day of Tiger Stadium on September 27, 1999 which he announced. We watched footage of the classic stadium that day and heard Ernie’s words. We tearfully watched and listened to the last few minutes of the play, Ernie’s actual voice and words during his final speech to the packed house at Comerica Park on September 16, 2009. 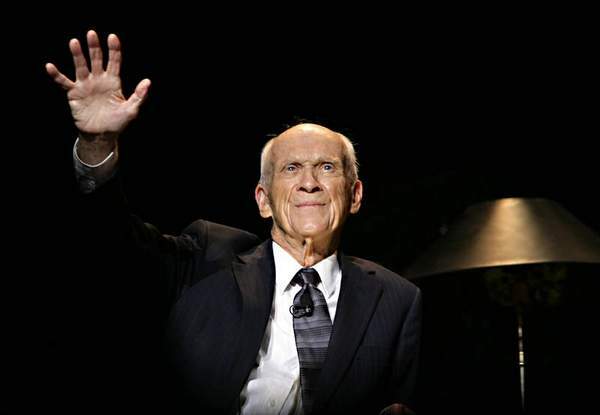 It’s been less than two years since that night but we could still feel the “depth of his heart” on that “wonderful night” in the state of Michigan, where he was planning to be at the end his life’s “journey” of 92 years. Woody Allen in Midnight in Paris dreamed of going back to a time when he could talk to the great artists and writers in a beautiful city. I dream instead of traveling 30 years in the past to Farmington Hills, Michigan on the night of August 14, 1981. I drive over to my parents’ house on a warm summer night to celebrate my dad’s 50th birthday. We have dinner with Kenny, Leslie (home after college), mom and dad, and celebrate the big birthday with ice cream cake from Baskin and Robbins. And after dinner, we go outside with the radio and listen to Ernie Harwell announce the game against the New York Yankees. It’s now, 30 years later, that we know that Sparky, no longer with us, was dead-on with his prognostication. Today, I am 54 years old and my dad is nearing his 80th birthday. He goes to dialysis twice a week and his weight is down to about 110 pounds. Kenny and Ernie Harwell are “loong gone,” as Ernie often said when announcing a home run. We still have our memories though, the mementos of life, dreamsongs playing over and over in our heads. I don’t really remember if I came over my parents’ house for my dad’s 50th birthday or saw Leslie or played catch with Kenny or listened to Ernie on that particular night. But in my mind, I can still hear Ernie’s soothing voice and see my dad with his thick black hair eating ice cream cake. The number 50 on the top of the cake is green and large. I can still picture Kenny, laughing, his left arm perched high in the air. He is thrilled to be lost in the game of catch and throws the ball back to me over and over again…over and over. I think that this is a wonderful and expressive piece.